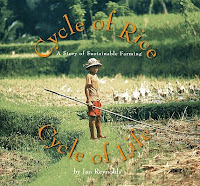 Cycle of Rice, Cycle of Life: A Story of Sustainable Farming by Jan Reynolds. (Grades 3-5.) Lee & Low Books, May 2009. Copy provided by my local library. For thousands of years, the rice farmers of Bali grew rice in a traditional, sustainable way, based on the water cycle. Because Bali only gets fresh water from the rain that falls on the island, there was an established system for sharing the water and routing it through the different farms on the island. When the Indonesian government insisted that the farmers try to increase productivity by planting genetically engineered rice, the system collapsed and so did Bali's rice production. Reynolds starts by describing the water cycle and the irrigation system on the island. Then she moves into a clear, detailed description of Bali's farming cycle and why it works so well. The cycle of rice was not just a farming tool for the people of Bali. Religious leaders met with farmers and they divided up the water and created a schedule for sharing the water. They all worked together to devise the schedule each year, which brought them together as a community. So, when the farming cycle broke down, it hurt more than just the rice productivity. It threatened the very fabric of Balinese society. Reynolds presents all of this in an accessible way with beautiful photographs illustrating the information. There is a strong emphasis placed on sustainability, which makes this title an interesting addition to units on ecology and the environment. An author's note urges readers to consider eating locally and organically in order to protect the environment. A map of Bali and a glossary are included. Take a gander at some of Jan Reynolds's photos and read an interview with her at Seven Impossible Things Before Breakfast. Apparently there was a Cycle of Rice blog tour in April, so I'll point you to the review at Paper Tigers which includes links to the other posts at the bottom. Happy Nonfiction Monday! Anastasia's got this week's round-up (and she's also put the call out for hosts) over at Picture Book of the Day! This wasa nominee for the CYBILS and I loved the phtos in this book. The whole concept of how dependant Bali is on the sustainable rice grwoing was fascinating. It illustrates the challenge we had with determining the finalists in this category.